Published Jun 12, 2017 By Julia 33 CommentsThis post may contain affiliate links. 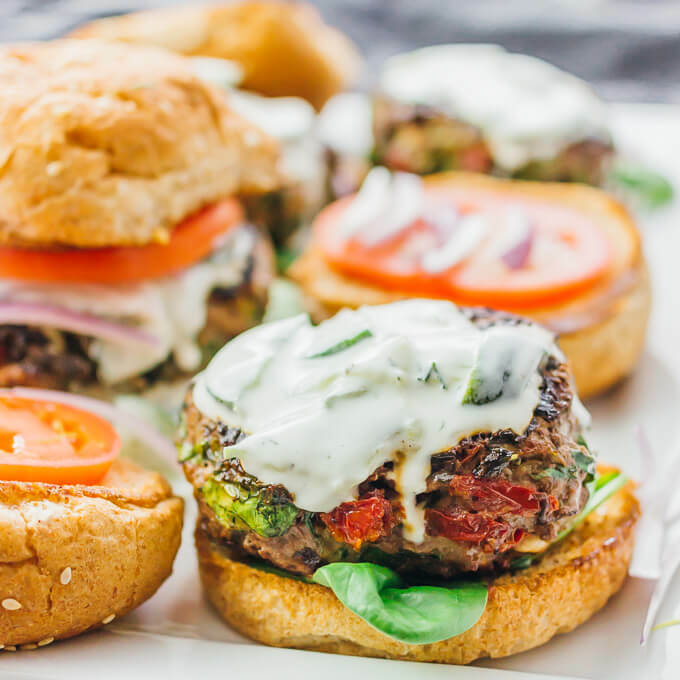 These Greek burgers plus my Hawaiian steak kabobs have made their way to the top of my summertime grilling wish list. 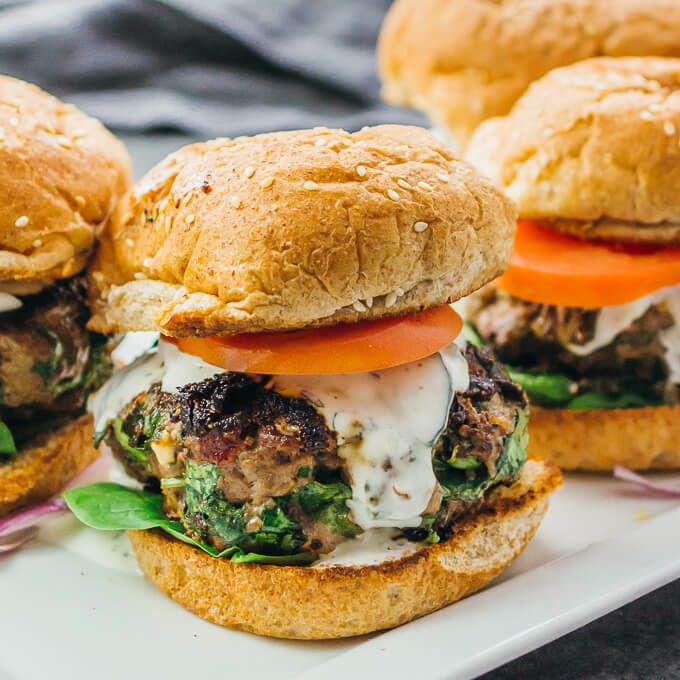 Whether you prefer to grill your burgers, bake them, or pan sear them, these Greek burgers will be sure to satisfy your burger cravings and you will love all of the flavors and textures going on here. Most prominent are the sun-dried tomatoes and feta cheese, followed by the spinach and tzatziki sauce. It is such a killer flavor combination. I’ve been wanting to make a Mediterranean-inspired burger ever since Mr. Savory Tooth and I were having lunch with my parents at a cozy Greek place last December, when he ordered a spinach and feta burger topped with crispy fried onions on a brioche bun. I remember taking a photo of it and thinking to myself, I have got to make this. 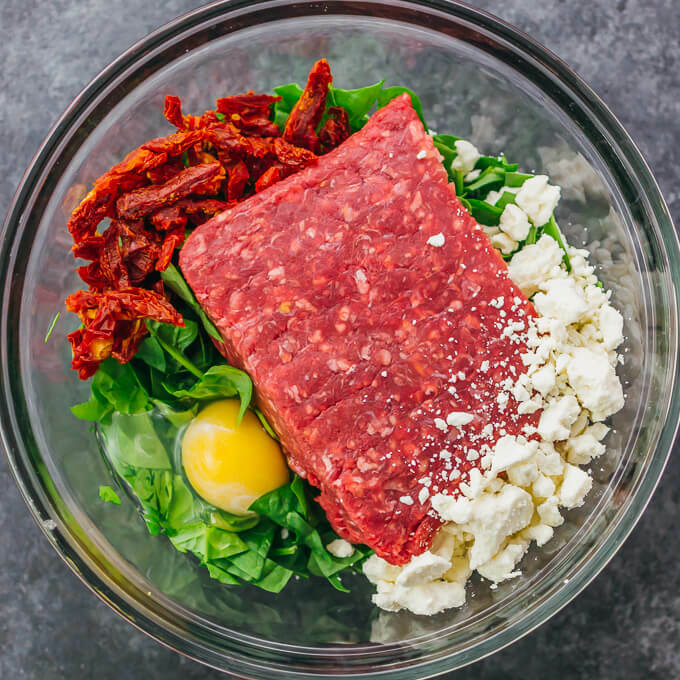 I love looking at all of the colors of the fresh ingredients coming together to form the burger patty. This might look like a lot of spinach, but it’s not, as the spinach will shrink when it cooks. I recommend finely chopping up the spinach so that the patties are easier to form and keep together. This recipe yields four big patties, which you can mix and form ahead of time. They should be refrigerated until you’re ready to cook them, and refrigeration also helps harden them so that they don’t fall apart when cooking. While all of the burger patty ingredients are non-negotiable here, the burger buns and toppings are where you can get creative and do your own thing. I like giving my burger patty a bed of baby spinach to lie on, drizzled with tzatziki sauce, and topped with some sliced onions and a tomato slice. 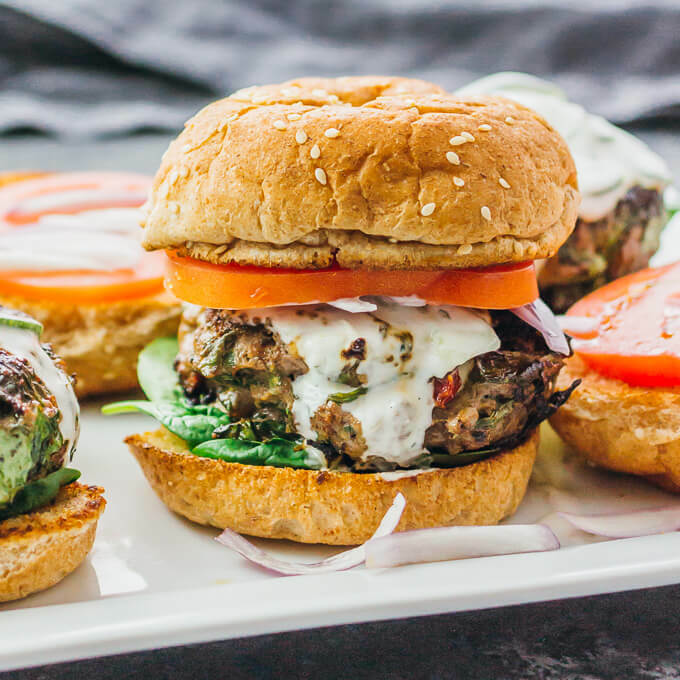 But I know that’s not going to fly with everyone else (for one, Mr. Savory Tooth is weirdly not a fan of tzatziki sauce), so you can jazz up these Greek burgers however you like. Greek salad. Yes, yes, and yes. This Greek salad even comes with a creamy avocado dressing. Greek fries. Who else thinks that Greek fries are the best fries? Greek dips. I’m talking about those dips with multiple layers in them. Increase to medium-high heat or keep at medium heat to lessen the amount of smoke (it will just take longer to cook). Drizzle cooking oil over the pan. Working in batches, cook the patties until charred on both sides and the internal temperature reaches 160 F, flipping occasionally. Add more oil if the pan gets dry. Assemble the burgers by distributing the meat and toppings among the buns. Serve hot. I’m planning on making these soon but with ground turkey. Question: do I need to add anything to it to make it stick together since I’m using ground turkey? Like maybe bread crumbs? I don’t think so. Should be fine substituting with ground turkey. Can they be cooked on the bbq? Yes, you can definitely grill it! The same way you would do for any burger on your grill. O. M. G. This is amazing! I used a “Mediterranean” Feta and I withheld the shallots (not a fan of raw shallots)… and it tasted AMAZING! I think maybe adding onions into the burger patty would be good! I will try that next time. Next time may be tomorrow.. haha! Thank you for posting this recipe! Haha I’m so glad you loved the recipe!! I’ll have to try Mediterranean Feta sometime… that sounds so delicious 🙂 Thanks for your feedback! 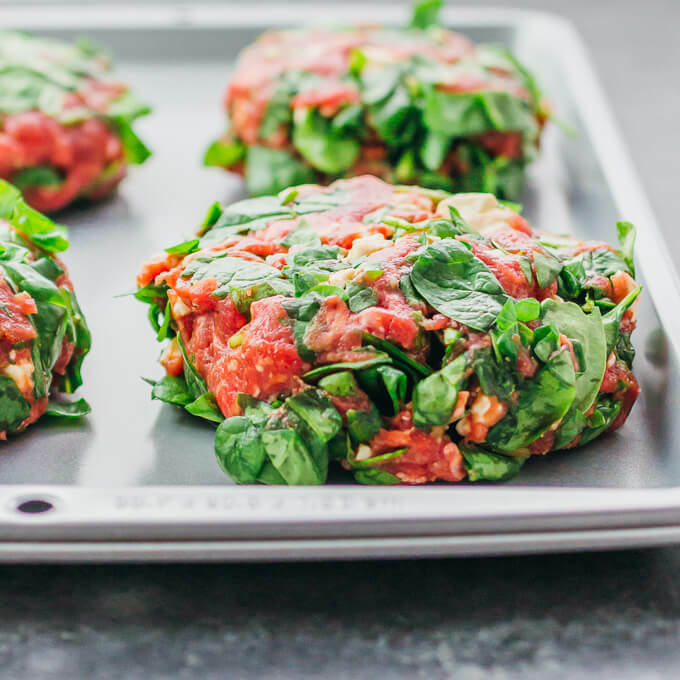 Do you think this would work as a “meatloaf” (really lamb loaf) instead of burgers? That might work. For meatloaf, I usually use meat that’s more fatty, otherwise I end up with dry tasting meatloaf. If you’re using lamb that’s pretty lean, dryness may be an issue. I just made these tonight for dinner. We left out the sun-dried tomatoes because my husband doesn’t like them. Instead of buns we used small pita pockets. I spread the tzatziki inside with chopped tomatoes. They were a huge hit and will definitely be on our menu again. Can I freeze these prior to cooking? Hi Tamara! I don’t see why not, but I haven’t tried freezing them myself so I can’t say for sure. How do you make the tzatziki sauce? Hi Alison! I usually buy tzatziki sauce at the store. My favorite is Trader Joe’s tzatziki sauce, which you can find in their refrigerated section. You can make it yourself, but it’s a lot of work… you need to grate cucumber and strain it, then mix with yogurt, garlic, oil, vinegar, salt, and let it sit overnight. You also have to be careful that you get rid of excess juice so the sauce isn’t watery the next day. Have you every made this recipe in meatballs? Thank you! Just made these, delicious!! The only thing is, I forgot to get sun dried tomatoes so made them without. We will definitely make this recipe often throughout summer! Thank you for posting! Hi hoping to make these tonight can they b grilled? Absolutely. Hope you enjoy them! That should work, maybe 20 minutes at 350 F and turning halfway. Make sure it’s at least 160 F in the center. These were fabulous! I used ground turkey instead of ground beef. Can’t wait to make these! Do you use dried sundried tomatoes or the ones in oil from a jar? This is my absolute favorite burger. My grand-daughter ask me to make it but to use ground turkey, not my first choice because of the dryness of the meat. I added some of the oil from the sun dried tomatoes to help with the dryness and they were wonderful. Will make again and try the ground beef. Thank you. We made these tonight BUT we used lightly grilled sweet onions, the spinach, and fresh mozzarella for the toppings. They were amazing! Thank you for sharing this wonderful recipe! Those toppings sound amazing 🙂 Thanks for your review! I am making these burgers tonight and I was wondering what other toppings might work well with it. My boyfriend is not a huge fan of tzatkiki and I wasn’t sure what other flavors might work. Thanks! Hi Alexis! My husband is actually not a big fan of tzatziki sauce either, but he loved these burgers with them. You could try replacing it with an avocado spread, hummus, or Greek yogurt. Basically, use some kind of spread so that the burgers don’t taste too dry without tzatziki sauce. Hope that helps and let me know if you have any other questions!